IMT Hyderabad has been able to establish a strong corporate connect and industry bonding in a short period of time compared to it’s elder cousins – IMT Ghaziabad & IMT Nagpur as well as similar B Schools. The institute engages with members of the corporate world through several initiatives like – Practitioners and business leaders play an integral part in course development and delivery at IMT Hyderabad; 15% sessions in the regular courses are taken by business leaders from different sectors of business over weekends to familiarize the students with the real time business scenario; Internship program where each student has to successfully complete internship under the mentorship of a business managers well as a faculty member for over a period of 14 weeks. But probably the highest level of passionate, fun filled engagement can be seen through it’s initiative the ‘Ace Connect’. Ace Connect is an initiative of IMT Hyderabad which is beyond the class room, rather, in the fields. It brings together corporate executives to compete in various sports like Cricket, Football, Volleyball, Basketball and Table Tennis. More than 200 participants from the corporates likes – Oracle, Tata Advance Systems (TAS), Infosys, Covidien, TCS, DSP, CBRE, Deloitte, Microsoft, Tech Mahindra and GN Resound took part in the 2 days event in the sprawling campus this year. Excitement was palpable in the air and across the campus. 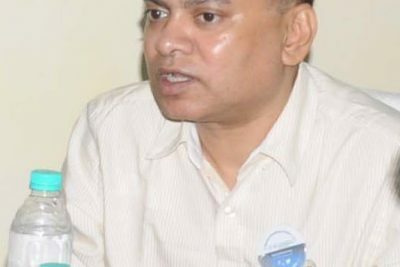 A very delighted Amartya Biswas, from Infosys, said, “It is a very nice effort. The facilities provided to us were good. There was an emotional touch associated with the event. We felt like we were back in college again”. “This is the third consecutive year for which TAS is visiting IMT Hyderabad and it was a great experience as always. I had two really good days at the campus and can’t wait for next year’s edition of Ace Connect” added, Mohd. Asif, from Tata Advance Systems. 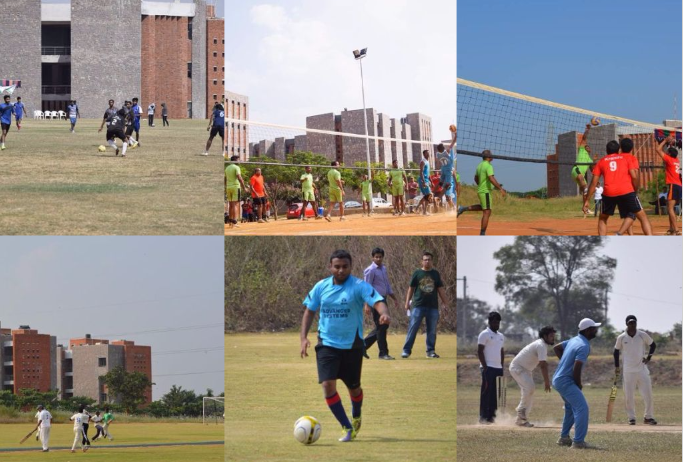 The cricket final was played between Deloitte and IMT Hyderabad. The hosts, IMT Hyderabad won by a close margin of 5 runs, while the Volleyball matches witnessed Oracle teams (2 teams were from Oracle) giving tough fight to Infosys and GN Resound. The final of Table Tennis was again between Oracle and Microsoft with the later winning the match. Enthusiasm around the football matches were unbeatable where the final battle was between TAS and Tech Mahindra. TAS won the match by 1-0. At the end of the 2 day event, a presentation ceremony was held at the amphitheater of IMT Hyderabad. Cultural performances were followed by prize distribution ceremony. “Integrating the curriculum and pedagogy with the growing demands of the industry and making it relevant to the work place is an ongoing process at IMT Hyderabad. But it is also important that we create opportunities for our students to interact with professionals both at a formal and informal level in order to adopt corporate culture; follow the trends and practices closely. In addition to that encouraging people to adopt a healthy lifestyle and promoting professional well-being has also been our constant endeavor” said, Dr. Satish Ailawadi, Director, Institute of Management Technology Hyderabad. “Ace Connect is all about the five S’s of sports – Stamina, Speed, Strength, Skill and Spirit which were displayed by the teams on field”, added Prof. Nitin Gupta, faculty at IMT Hyderabad.Incidentally, faculties and students participated in the Hyderabad Marathon and also organized a Trail Marathon earlier to encourage healthy lifestyle, fitness and well-being among students, faculties and professionals. The Institute has a state of the art 30 acre campus situated near the Rajiv Gandhi International Airport in Hyderabad.The Industry centric approach has paid them well. More than 50% students of the current (2015-17) batch have already been placed with a highest offer of INR 22.5 lacs so far coming from a leading edge technology company. Applications are now open for 2017-19. Nirmalya Pal: Over 19 years of versatile experience in Integration of People, Process & Technology, Knowledge management, Productivity enhancement. Assisting clients in performance enhancements and building behavioral & functional competencies. Enterprise learning Initiatives through Business Simulation. HRM Solutions.